In the past, we have written all about infographics (see here for example) and have even amassed a large collection of Jewish infographics (here and here)! Nowadays, it seems that everywhere you turn there’s an infographic presenting information to the masses. People love infographics because they easily convey information in a visual way—and best of all, infographics can go viral and increase awareness of a cause, organization, or campaign. 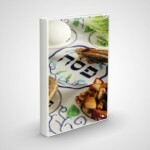 To that end, if you are looking for a Pesach-related infographic, we have several here. 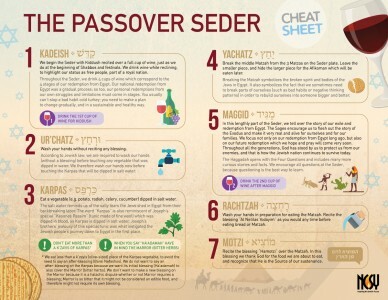 However, there are not many Jewish infographics—and certainly not ones that explain to the scholar and layperson the basic steps of the Passover seder…until now. Thankfully, we just received word that NCSY created a Passover Seder Cheat Sheet infographic for their NCSY Education website. You can now download the infographic for free here and share it with congregants and students so that they can print out this sheet and use it as a guide throughout the Passover seder. Plus, this infographic also explains why we have salt water, matzah, and bitter herbs at the Seder as well as when we drink each cup of wine and what the seder customs teach us about achieving personal freedom? We encourage you to use this infographic on social media or share it via email to help anyone quickly learn or review the steps of the Seder.